The choir normally meets for rehearsals every Monday evening at Dartmoor Lodge, South Brent, usually at 7pm, the exceptions being July, August, Festivals and Bank Holidays. Please contact our Chairman or Secretary as below for further information. Rehearsals as above. (Refer to emails for amendments). Due to PGL annual Meeting there will not be a Rehearsal on Monday April 15th at South Brent. Monday, April 15th Annual Meeting of Provincial Grand Lodge at the Riviera International Conference Centre, Torquay, TQ2 5LZ. Rehearsal at 9.30 am. April 29th - as normal. All rescheduled meetings are booked (courtesy of Peter Moore) at the Old School Community Centre, Totnes Road, South Brent, TQ10 9BP, between 7pm and 9pm. This is no more than 50 yards down the road from the Dartmoor Lodge, on the left going towards the village centre. There is a small car park attached. All rescheduled meetings are on a Thursday evening between 7pm and 9pm. May 6th - cancelled - rescheduled Thursday May 9th at The Old School Community Centre. May 13th - cancelled - rescheduled Thursday May 16th at The Old School Community Centre. May 20th - cancelled - rescheduled Thursday May 23rd at The Old School Community Centre. Saturday June 22nd - Cadogan Court Annual Fair. - details to be confirmed. 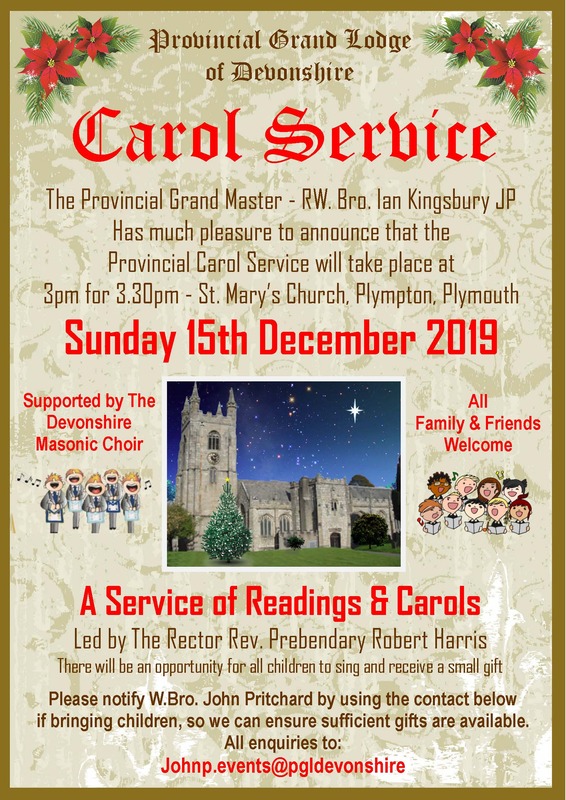 Sunday December 15th - St. Mary's Church, Plympton. 3pm for 3.30pm.